Endangering indigenous communities in Panay – Bombard the Headquarters! 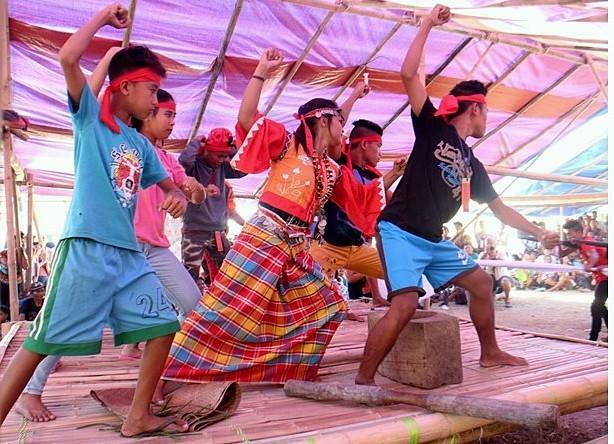 The Binanog dance performed during the 2016 Tumanduk nga Mangunguma nga Nagapangapin sa Duta kag Kabuhi (TUMANDUK) Assembly held in Tapaz, Capiz earlier this year. Photo credits: TUMANDUK. In his first State of the Nation Address last July 25, President Rodrigo Duterte urged indigenous peoples to make use of the Indigenous Peoples’ Rights Act (IPRA) and the National Commission on Indigenous Peoples (NCIP) to protect their rights and welfare. “Government has given you the legal tool to improve yourself financially, economically and socially. Make use of your ancestral domain. Do not let it remain idle,” he said. But indigenous groups have a less favorable view of the IPRA; they say it has been used as an instrument to railroad big projects that encroach on indigenous lands rather than to empower indigenous peoples to defend their communities. According to the Kalipunan ng Katutubong Mamamayan ng Pilipinas, the certificates of ancestral domain title issued under the law have facilitated the transfer of ownership and exploitation of ancestral lands under compromised indigenous leaders. This is clearly demonstrated in the way the Tumandok people of Panay, also known as the Panay-Bukidnon, will be displaced from their homes and farmlands to make way for the construction of the Jalaur Mega Dam in Calinog, Iloilo. Last July 16-18, I joined an international solidarity mission to look into the proposed dam. The mission delegates represented 26 organizations from five countries—Belgium, Germany, Italy, the Philippines and South Korea. According to Berna Castor of the group Tumanduk nga Mangunguma nga Nagapangapin sa Duta kag Kabuhi (or Tumanduk), the IPRA has been used to facilitate the approval of the dam by “tribal elders” organized by authorities for the singular purpose of legitimizing the project. She said the elders who had expressed their approval were not chosen by the community, and mostly comprised those whose lives and livelihood are not directly affected by the project. The tribespeople who spoke during our delegation’s uphill trek to the communities along the Jalaur River in Calinog talked about the destruction of not only their homes but also their livelihood and cultural heritage. In fact, at least 6 Tumandok burial grounds and sacred sites along the Jalaur River will be desecrated with the building of the dam, according to a research study presented during the ISM by University of the Philippines Visayas graduates Mar Anthony Balani and Jude Mangilog. Delegates of the International Solidarity Mission fording the Jalaur River. Tumanduk maintains that the “consultative assemblies” organized by the NCIP presented only the advantages of building the dam and masked the negative impacts. It says the affected communities were promised incentives in exchange for support, and those who oppose the project were harassed by state forces. The group adds that the National Irrigation Administration (NIA) has not informed those affected of the environmental hazards posed by the dam, such as the existence of the active Panay fault a mere 11 kilometers away from the dam site and the Mines and Geosciences Bureau report on the high risk of landslides in the area. The proponents hold that the Jalaur Mega Dam, also known as the Jalaur River Multipurpose Project Phase 2 (JRMP II), will provide irrigation to agricultural lands, augment potable water supply, and deliver electricity to the province of Iloilo. Remmy Celeste of the Calinog Indigenous People’s Organization, a government-accredited and sponsored group, told the mission delegates during our courtesy call on Calinog Mayor Alex Centena that “little sacrifices” are acceptable in exchange for development. “Without the dam, nothing will happen to us. Yes, some will sacrifice. Some properties will be damaged and inundated,” Celeste said in Filipino, adding that these “sacrifices” will be more than offset by the livelihood projects, scholarships, and roads that the dam will bring. A priority project of the Aquino administration, the P11.212-billion JRMP II is mainly funded by an P8.94-billion loan from the Export-Import Bank of Korea with counterpart funding from the Philippine government. The very idea that marginalized communities can be entitled to public assistance and social services only if they agree to the project is in itself questionable. And yet the official state discourse continues to paint those who resist the project as opponents of development. The Tumandok mapping the destruction and displacement that the dam construction will cause. Photo credits: Jalaur River for the People Movement. “The life of the indigenous peoples has remained the same. Will we not give them the opportunity to improve their lives?” said Iloilo Gov. Arthur Defensor Sr. during our dialogue at the Provincial Capitol. But improvement from whose perspective? In limiting the issue to the conflict between those who support and those who oppose “progress,” the official narrative has sidelined dissenting voices and alternate visions of development. Tumandok Nestor Castor asserts that development for his people means the improvement of agricultural practices, raising the productivity of their land, and the provision of social services like health and education. “You see we are here upland but only the lowlands will benefit from the water that flows through the dam. But the proponents do not see the destruction it will cause, they only see their own gain,” he said in his native tongue. This demonstrates that development is possible without displacing the Tumandok. It is thus imperative for the Duterte administration to review JRMP II and all other “development” projects that encroach on indigenous peoples’ ancestral lands. Part of the Tumandok oral tradition narrates their belief of the known world divided among the kingdoms of their epic heroes. The kingdom of Datu Humadapnon is in the sky, that of Datu Labawdunggon in the mountains, that of Datu Paiburong in the lowlands, that of Datu Paubaya in the seas, and that of Datu Sagnay-Lunok underground. Children playing along the river banks of Jalaur in Barangay Agcalaga, Calinog. Alas, the realms of Paiburong and the other datus have been successively taken from them, and what remains today is the mountain realm of Labawdunggon’s kin. And even these remaining ancestral lands of the Tumandok, along with their collective identity rooted in the native soil, are threatened with destruction. “The dam will kill our people. Not only will we lose our homes and livelihood. The dam will force us to scatter across the plains. Our culture will disappear with the dissolution of our communities,” Tumanduk leader Roy Giganto said in Kinaray’a. This is the reason for the unshakable commitment shown by the Tumandok men and women we spoke with in defending their land, livelihood, and cultural heritage. Speaking in his native language, Nestor Castor said: This land has been ours way before the coming of the Spanish colonizers. We will not allow outsiders to drive us away so that they will become the natives and we will become the outsiders. Note: This commentary was originally published by the Philippine Daily Inquirer on September 7, 2016. The version posted here includes portions that were not in the version submitted to the paper’s editors due to space constraints. International Solidarity Mission delegates listen to testimonies by Tumandok men and women in Barangay Agcalaga, Calinog. Photo Credits: Jalaur River for the People Movement. Pingback: Maya Daniel: poet-painter, revolutionary – Bombard the Headquarters!